We’ve got your back. Covered that is. When you purchase a Hino Truck, you don’t need to worry if your truck breaks down. 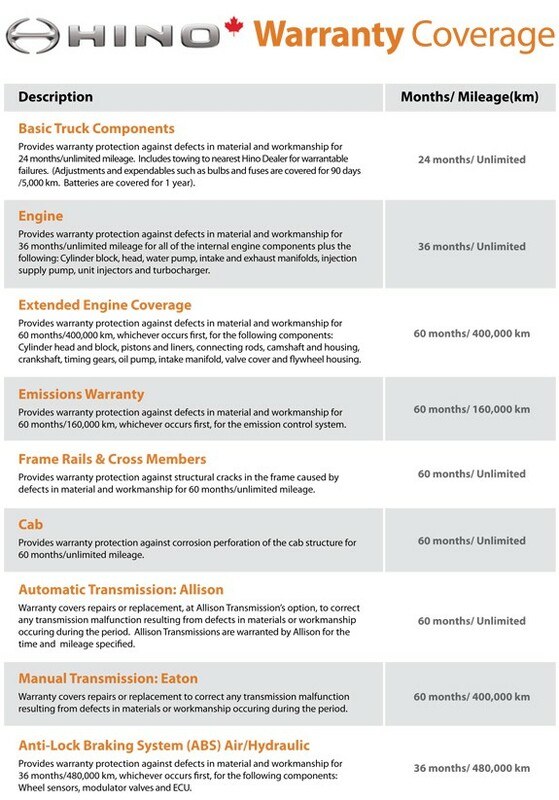 Hino offers a truly comprehensive warranty program the exceeds industry standards won’t leave you stranded. Every new Hino truck is covered by Hino’s industry-leading 1-3-5 Customer Care Program. This program consists of a fve year engine and transmission warranty, three years of HinoWATCH roadside assistance and a free one year/50,000 km recommended maintenance package. If you would like a more comprehensive explanation of our warranty program, or would like to submit a warranty claim, please contact your Tri Truck Centre, your Sothern Ontario Hino full service dealership.